Welcome to the Glengoyne Distillery:: A whisky and chocolate tour! Where: Glengoyne Distillery, Dumgoyne, G63 9LB. When I opened the envelope containing the trip itinerary, I got a bit of a butterlies feeling in my stomach reading ‘An evening of Whisky and Chocolate Tour at Glengoyne‘. 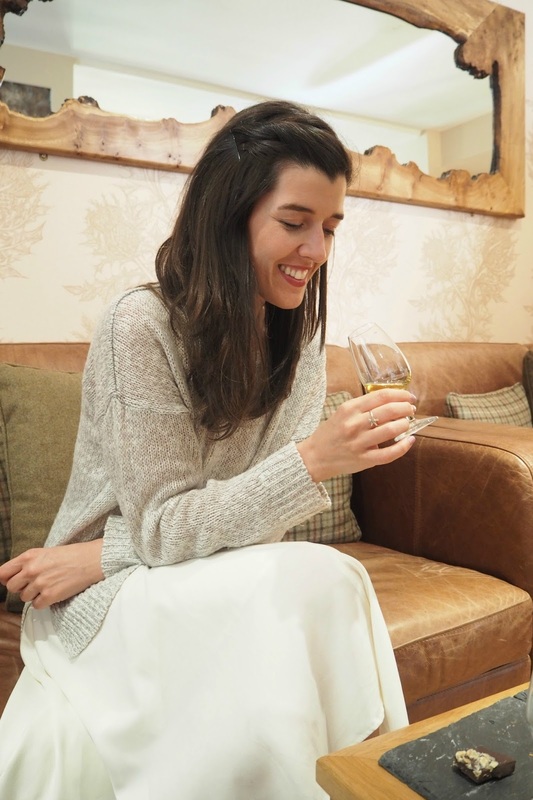 I am not a big whisky fan, as a matter of fact whisky is on the bottom of my favourite drinks list, however having the chance to visit this iconic Scottish distillery and to try their 21 years old whisky, certainly was enough to intrigue me! The distillery nestles in the most beautiful location you could ever imagine; surrounded my waterfalls, tall trees and a lake, its no wonder Glengoyne has been said to be the most beautiful distillery in Scotland! Just a forty minutes drive from Glasgow it makes the ideal day trip-with such stunning location you could enjoy the outdoors after the tour or even go for a meal at nearby village, Balloch. Before our tour we wandered around the grounds and found so much peace, something I never thought I’d find in a whisky distillery. The waterfalls were stunning, observing the water flow is one of the most relaxing things in life, and with all the greenery around it feels like you are in the middle of the woods. Our tour started with a taste of Glengoyne whisky; a smiley lady wearing a traditional kilt, was holding a silver tray full of whisky shots and was offering us a glass upon our entry to the tour suite, (which was filled with hand carved furniture and Moroccan style red carpets-absolutely beautiful!). We were given a short presentation about the distillery’s story, the manifesto and also heard a few of the employees talking about the distillery’s philosophy and how proud they feel to work in this place. After this it was time to let our glasses down and go outside in the balcony, from there we were led to the distillery were magic happens! Unfortunately pictures were not allowed but I can tell you that it has the best smells and it makes you like whisky in the split of a second! The distillery follows six guiding principles rooted in nearly 200 years of the craft. An unwavering commitment to the environment. And a gathering of like-minded people. This is the Glengoyne Way. Unpeated:: They always dry the barley by air, this means there is no smokiness in the whisky. That’s why they take care crafting the spirit, coaxing it through the slowest stills and then maturing it in fine sherry casks. Patience:: The people in the distillery proud themselves of having the slowest stills in Scotland! Oak casks:: The distillery uses sherry casks that are rare and very expensive. Maturation:: Each Glengoyne cask is handled with meticulous care. Natural colour:: There are two ways to give whisky its colour; the first one is expensive and time-consuming, the second one is cheap and easy, you just have to add a few drops of caramel at bottling. In Glengoyne casks are emptied after six years of absorbing the rich colour and flavour, and of course they choose the hard way. Tradition:: Glengoyne’s philosophy is that progress is measured in centuries not in decades. Everything here moves slowly and there is nothing and no one to be in a hurry. Duncan McNicoll, a Glengoyne stillman said: “Our craftsmanship can be tasted in every bottle that leaves our distillery”. And that is exactly what we tasted in the whisky and chocolate experience that followed…. Imagine being in a living room with tartan sofas and wooden tables that have chocolate and whisky served on granite trays and you will get the idea of the whisky and chocolate tour excitement we got in our stomachs. We entered this lovely living room area and we were asked to sit in front of each table. On each tray there were two glasses containing a twenty-one and a fifteen years old whisky, and four pieces of different flavours chocolate, all meant to be enjoyed by each person. We were guided through the tour on how to taste the youngest whisky first, what it would feel like to get a bite of the dark chocolate just after you drink a bit of the spirit, and how to sip, smell and enjoy the flavour. The twenty-one years old whisky felt very strong to my palette, I could feel the alcohol running down my throat and a burning sensation made me bite a bit more chocolate than I was allowed to eat. The fifteen years old whisky felt a bit thicker and less strong, even though both of them had exactly the same amount of alcohol! I ate a bit of the toffee chocolate while drinking the spirit and it really felt like a thing I could get used to and do it as a Saturday night ritual! There were a few very knowledgeable people in our group and I loved listening to them talking about whisky and the different tours they have done through the years. I could see the passion in their eyes and feel their excitement being at Glengoyne right there. Even though, like I said in the start of this post, I am not the biggest whisky fan, I felt happy to be there and be able to take this tour and taste all these marvelous flavours and aromas. Whisky is a delicious spirit to sip and if you get to appreciate the aroma then it might be your favourite drink. The Glengoyne experience made me come a step closer to adding whisky on the top of my favourite spirits list, and even if this won’t last long at least I have learned to appreciate a good drink with a bit of chocolate! Thank you Love Loch Lomond team for organising this tour for us, it was truly fabulous!